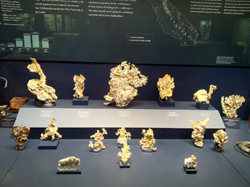 Dinosaurs, animals, rocks and gems, the students didn’t know which they liked the best. 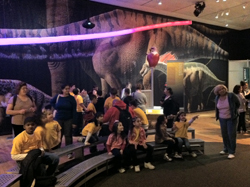 ACS spent the day at the American Museum of Natural History to visit the new dinosaur exhibit. Students were busy taking notes, on the dinosaurs, that they would later use in class working on various assignments. 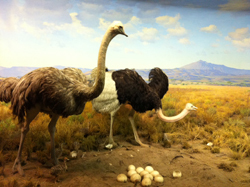 Some students were fascinated by the mere size of the animals and others marveled at their shapes. Sixth, seventh and eight grade students watched a video on dinosaurs internal organs, and as they watched the organ came alive on the dinosaur. Fourth grade students were told to pay special attention to the Native American exhibit since they are studying the Lenape Indians in Social Study. They saw longhouses, tools, and several different types of clothing. First graders were captivated by a video of the blue whale as they sat under the life size model of the animal. Parents were relieved just to have their children sit for a while, after walking up and down the stairs of the four-story museum. It was a perfect day at the museum except for the traffic on the return home. Several parents and students fell asleep on the bus ride home always an indicator of a successful field trip!